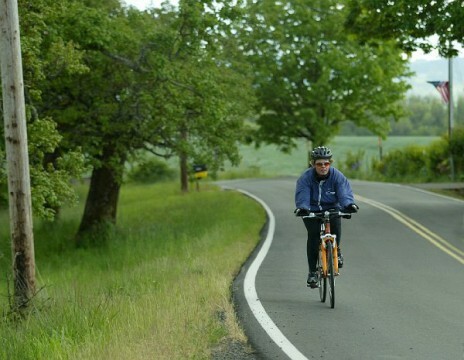 Have you mastered the basic skills to riding effectively on the road? Perhaps you have just purchased your first road bike, plan to enter a few fun rides this summer, or you have been riding with friends and decided to take your cycling a little more serious but are unsure of technique. Consider the following tips to riding better. The key to smooth shifting is anticipation. Shift a few seconds ahead of time. It makes taking on a hill more effective. At the bottom of a hill, shift to easier gears while you still have momentum. The shift should occur during one crank revolution. Ease up pedal pressure as you move the lever, time it right, and you shouldn’t lose significant speed. Until you have mastered the timing, simply push a bit harder for several strokes before lightening the pressure on the shift stroke. The goal here is to maintain your current work level and to conserve energy. Shift gears to maintain your cadence. By staying in your seat you will save energy for the long ride, but don’t be afraid to get up out of the saddle if you’re looking for more of a workout, it’s great for strengthening your core. Don’t “ride” your brakes. Your tires and rim could overheat which will cause a blowout. The safest technique is to tap the brakes, applying small amounts of pressure. When riding in wet weather, this technique works best. For quick stops, slide your fanny to the very back of the saddle and apply firm pressure the brakes. This keeps the rear of the bike down so that you don’t flip over the handlebars. Always, always brake evenly. Never grab only your front brake. If you find yourself inclined to do that (dominant hand or for other reasons), you need to spend you miles of riding training yourself out of that bad habit. Avoid pedaling in high gear for long periods. The best cadence for most cyclists is 60 to 80 revolutions per minute (rpm). Racers rpm will range 80 to 100 rpm. Pedaling for long periods of time in a high gear can develop injuries such as biker’s knee. It can increase the pressure on your knees and lead to overuse. Protect you knees by shifting to a lower gear and faster revolutions (rpm). Change your body and hands position frequently. Different muscles will take on the pressure as you shift your body. You will change the angles of your neck, back, and arms. This is important for any ride over 5 miles. If you ride regularly but never think to change positions, think again. Just because you’re comfortable in a certain position doesn’t mean your body wants to sustain that position day in and day out. Avoid coasting downhill. Lactic acid has been building in your muscles as you climbed up hill. By pedaling constantly with some resistance (even just a little) while coasting downhill you will help remove the lactic acid and reduce cramping. Seek out someone experienced to go riding with. Experienced riders or group of riders can teach you so much about how to ride different terrain and how to be a defensive cyclist. See the ORbike calendar for listings of free rides that are open to the public and organized rides that provide support and guidance. Great Tips! Very useful for all people to make a cycling as effective. Thanks for sharing this. I’ve started cycling to work after my car broke down, and I’ve noticed that it’s more difficult riding uphill than I thought. I would usually find myself getting off my bike to hike the rest of the way up hills, so I feel like knowing a few tips will make it possible for me to cycle all of the way for my daily commute. Shifting to a lower gear and staying in my seat seems like really helpful advice. I’ve had my gears really high this whole time, so I should try switching to a lower gear to help me feel less exhausted by the time I get home. Thanks for the tips! Some solid tips for every beginner cyclist.